IDEAL LOCATION FOR WARWICK CASTLE, NEC. Regrettably we do not cater for children under the age of 12. 'You can be assured of a friendly welcome to Hardwick House by resident proprietors Drenagh & Simon Wootton'. 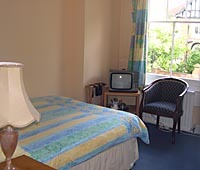 We maintain high standards of accommodation where cleanliness and comfort are paramount. 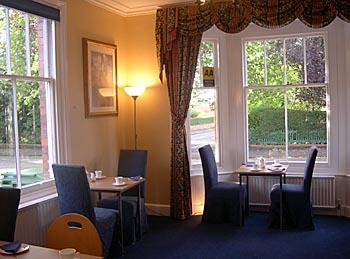 Hardwick House is an eight bedroom establishment; we have a reception lounge solely for guest use, an attractive dining room with full waitress service, where you can enjoy a delicious freshly prepared breakfast. For the sporting enthusiast, Cricket memorabilia adorns the walls; Simon used to be a professional cricketer. All our rooms are non-smoking, and are attractively decorated. 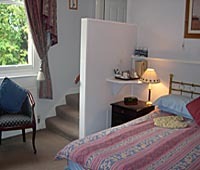 All rooms have ensuite facilities. There is central heating throughout and ample hot water at all times. 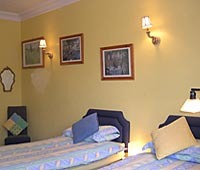 Tea & coffee facilities are in all rooms, also colour televisions. Most importantly we have a car park and are only a few minutes walk into the town centre, yet situated in a lovely quiet, mainly residential area. 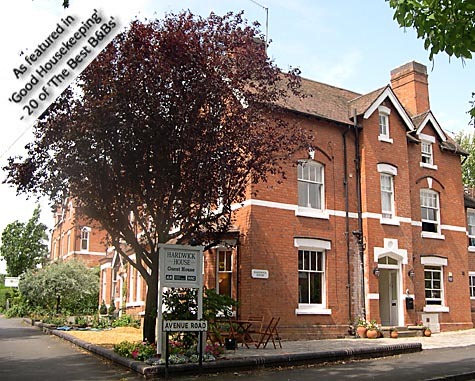 Stratford-upon-Avon is truly in the 'Heart of England' and is an ideal place to base your stay. Within easy reach are Warwick Castle, the Cotswolds, the Potteries, Oxford, Blenheim Palace, Coventry and Birmingham. Even London is only 90 minutes drive away. We very much hope you will stay at Hardwick House and look forward to meeting you. M40 junction 15 - take the road to Stratford-upon-Avon town centre (A439) and take the first right turn after the 30 m.p.h. sign into St. Gregory's Road, we are situated approximately 200 yards on the right. Directions from the 'Oxford Road' A3400 and 'Banbury Road' A422. At roundabout take road to town centre and come into Stratford over 'Clopton Bridge'. Then bear right following signs for Warwick (A439). Once on the Warwick Road bear left and about 200 yds beyond the Grosvenor Hotel turn left into Warwick Road and immediately left into St Gregory's Road. Hardwick house is situated approximately 200 yards on the right. See the road/rail/air/bus and map pages for full travel details. Cancellations: within 48 hours are liable for payment in full. Shakespeare's Stratford on the Web / QuinSolve &COPY; / January 2007.